2:48 Scene - Cary arrives home and is confronted by her son. 1:24 In this interview from 1986 (Entertainment Tonight) Falcon Crest Star Jane Wyman (Angela Channing) talks about the upcoming season 6 and the new guest star Kim Novak (Kit Marlowe). 1:24 Entertainment Tonight report on the series finale. 4:10 Jane and Bing Crosby sing In the Cool, Cool, Cool of the Evening, winner of an Academy Award for Best Original Song. 3:15 Jane with Hayley Mills in the "good examples" and "new clothes for Pollyanna" scenes. 1:26 William Hopper carries Jane up the stairs and "over the threshold." 4:01 A montage of stills accompanied by the music "Attraversiamo" composed by Dario Marianelli. 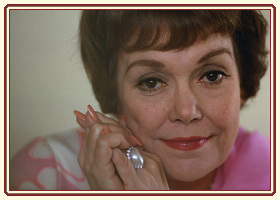 3:28 Jane Wyman 1914-2007. Two news reports of her passing, followed by a montage of pictures, posters, and short film clips. 8:04 Photos, stills, and clips spanning her career. 3:25 Photos and clips set to music. 1:54 News report of Jane's passing. Includes interview with close friend Virginia Zamboni.